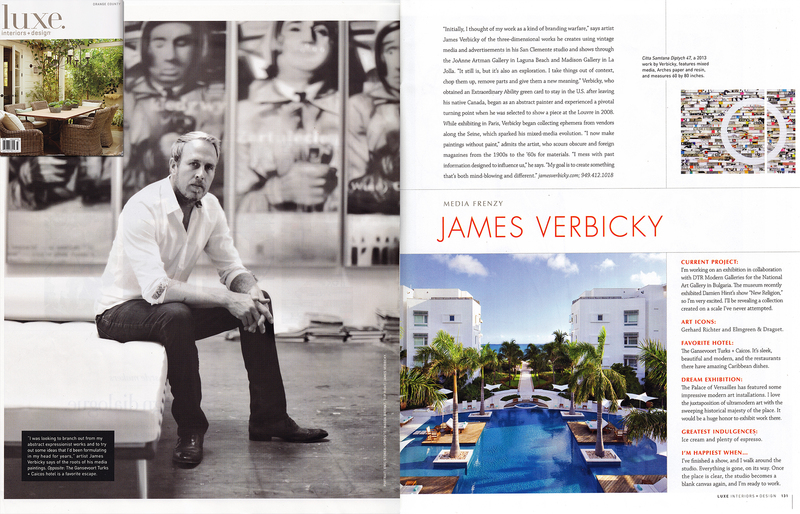 James Verbicky was just featured in the summer 2013 issue of LUXE magazine, Orange County. “I’m working on an exhibition in collaboration with DTR Modern Galleries for the National art Gallery in Bulgaria. The Museum recently exhibited Damien Hirst’s show “New Religion,” so I’m very excited. I’ll be revealing a collection created on a scale I’ve never attempted. The Gansevoort Turks + Caicos. It’s sleek, beautiful and modern, and the restaurants there have amazing Caribbean dishes. The Palace of Versailles has featured some impressive modern art installations. I love the juxtaposition of ultramodern art with the sweeping historical majesty of the place. It would be a huge honor to exhibit work there. Ice cream and plenty of expresso. I’ve finished a show, and I walk around the studio. Everything is gone, on it’s way. Once the place is clear, the studio becomes a blank canvas again, and I’m ready to work.